Invensys Foxboro offers the widest variety of element constructions and ranges in the industry. This versatility enables the 43AP Series Pneumatic Indicating Controllers to be applied to virtually any process. On-off, proportional, proportional plus derivative, proportional plus integral (reset), proportional plus integral plus derivative, differential gap, and automatic shutdown actions are available. The integral unit has the complete range from 0.01 to 50 minutes, and the derivative unit from 0.05 to 50 minutes. These controllers are available with an extensive list of optional features. Among these are internal bumpless automatic-manual transfer stations (two types), “batch” function, remote pneumatic set point, Type 70 electric contacts, and control valve mounting. 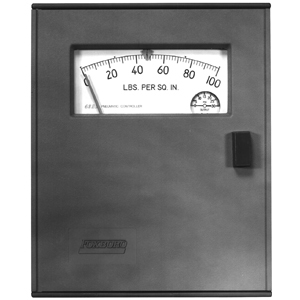 Both the control unit and the measurement element are mounted on a rigid steel plate. Thus, these components are isolated from case stresses due to mounting, and dependable accuracy is ensured.